ARM Cortex-M3 core and considered their mainstream ARM microcontrollers. The F1-series has evolved over time by increasing CPU speed, size of internal memory, variety of peripherals. 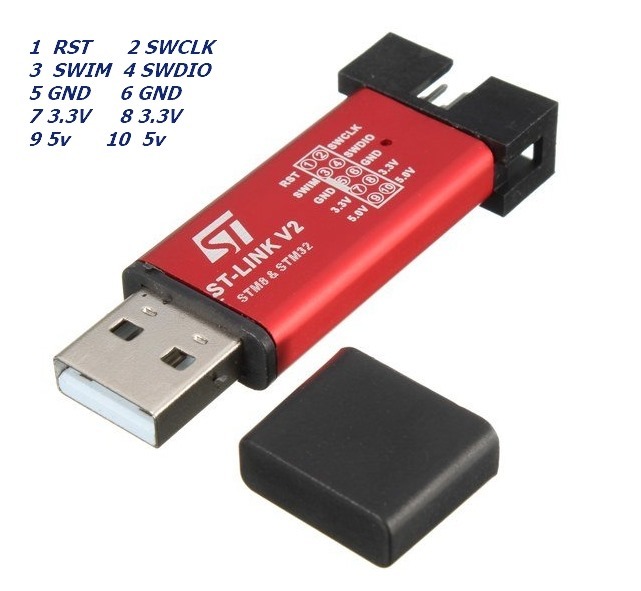 There are five F1 lines: Connectivity (STM32F105/107), Performance (STM32F103), USB Access (STM32F102), Access (STM32F101), Value (STM32F100). 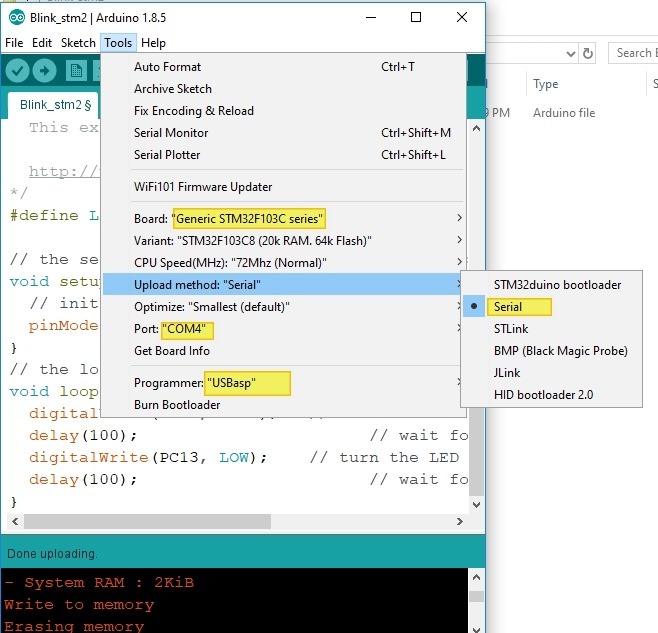 In this post we shall explore the ways to implement Arduino core on to STM32 so that programming can be done through Arduino IDE itself.You can enjoy the speed of 32 bit microcontroller with ease of Arduino IDE programming. 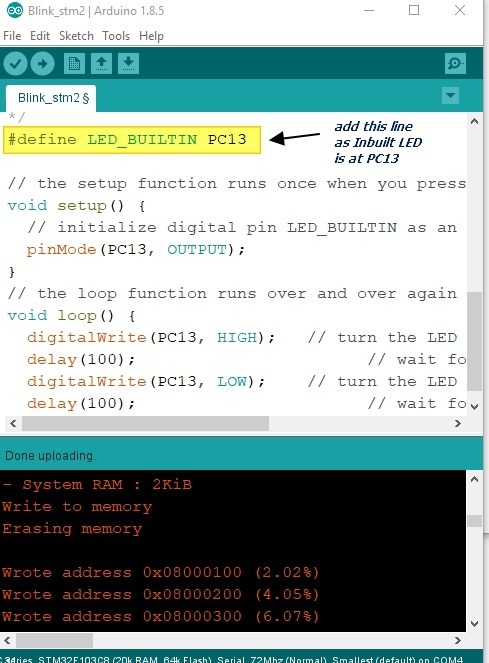 STM32 F1xx development boards are available in wide range.Here we shall use a simple board which is also called BLUEPILL . A very efficient & economy module easily available. 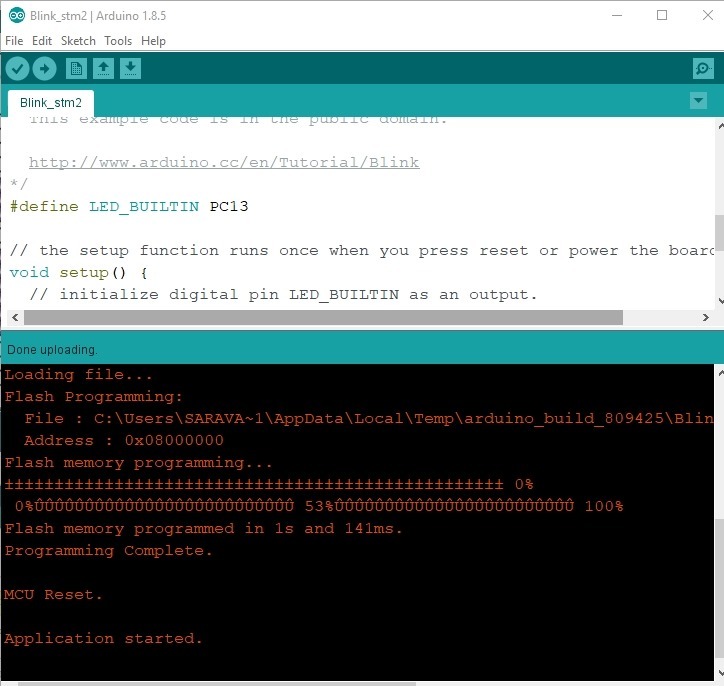 Programming can be done in many ways.This post is related to using Arduino core. 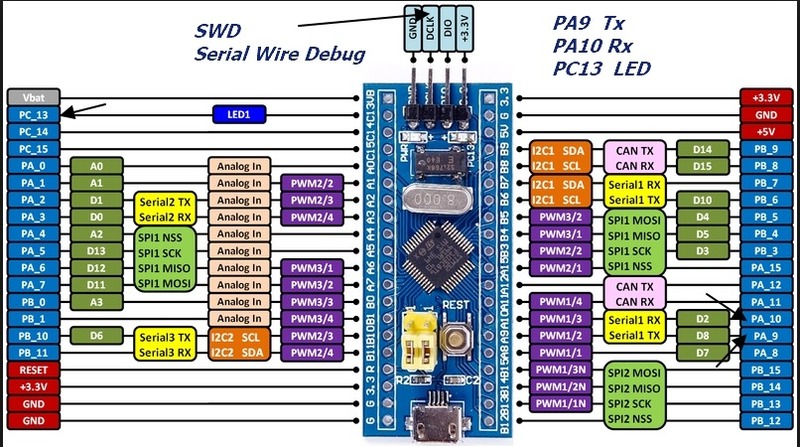 As seen in above picture , STM32 pill has 3 UARTs of which UART1 (PA9, PA10) is used to upload code.For this you need a USB-TTL module .Although the STM32 is 3.3v device many GPIO pins (shown in yellow underline in above picture) are 5V tolerant. 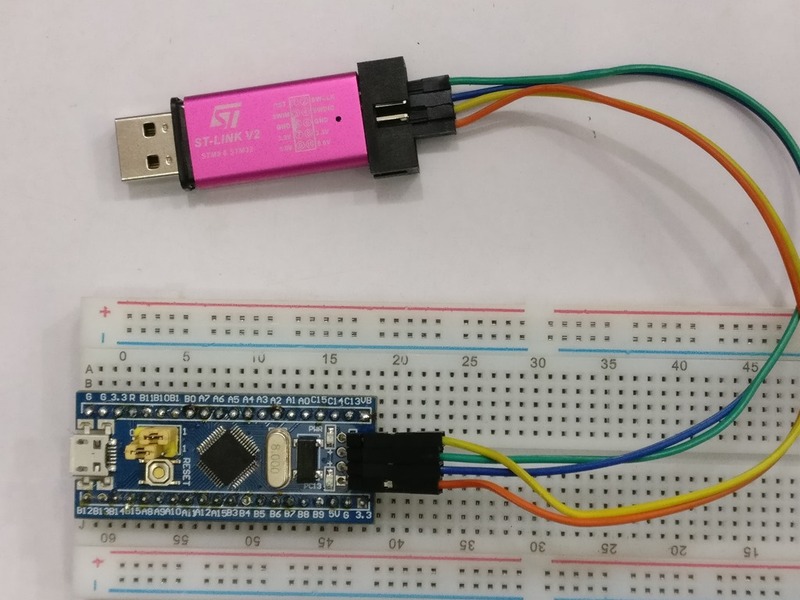 So you can use this USB-TTL *CP2102) module without any level shifter. 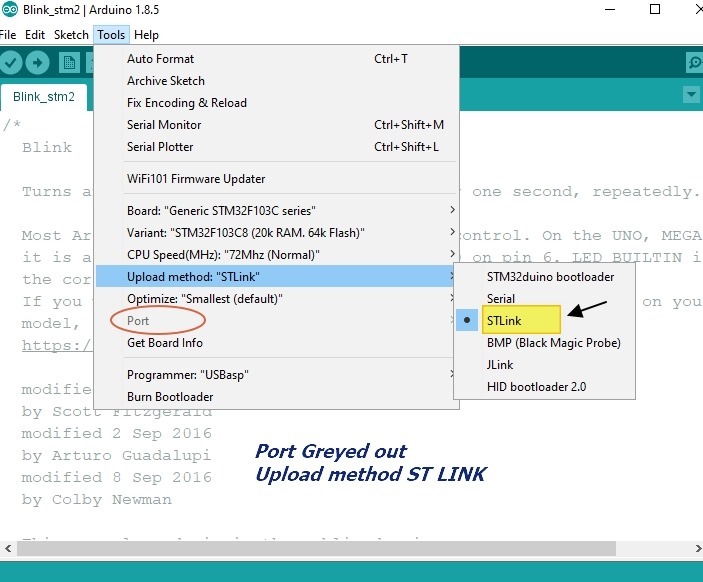 The other way to upload code is through SINGLE WIRE INTERFACE ModuleInterface (SWIM) .This uses only 2 wires SWCLK, SWDIO apart from power pins .You can see this as 4 separate header pins to the right end of module.You need a ST-LINK dongle or device to connect with the SWIM. 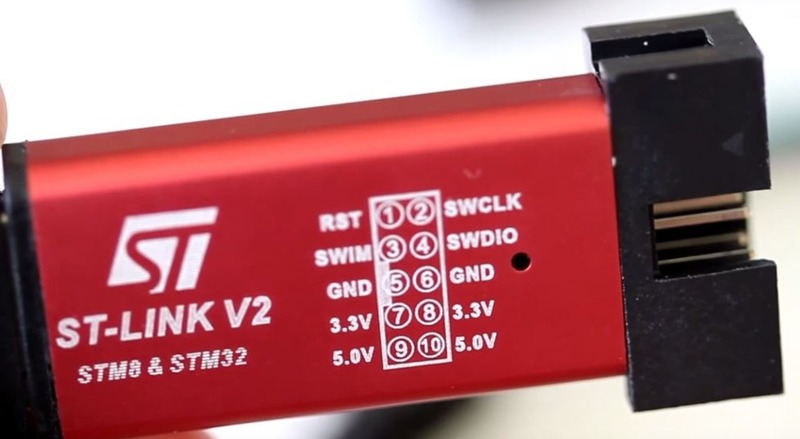 The ST-LINK/V2 is an in-circuit debugger/programmer for the STM8 and STM32 microcontrollers. The single wire interface module (SWIM) interfaces facilitate the communication with any STM8 or STM32 microcontroller operating on an application board. The bare STM32F103 board only comes with a default USART boot loader. 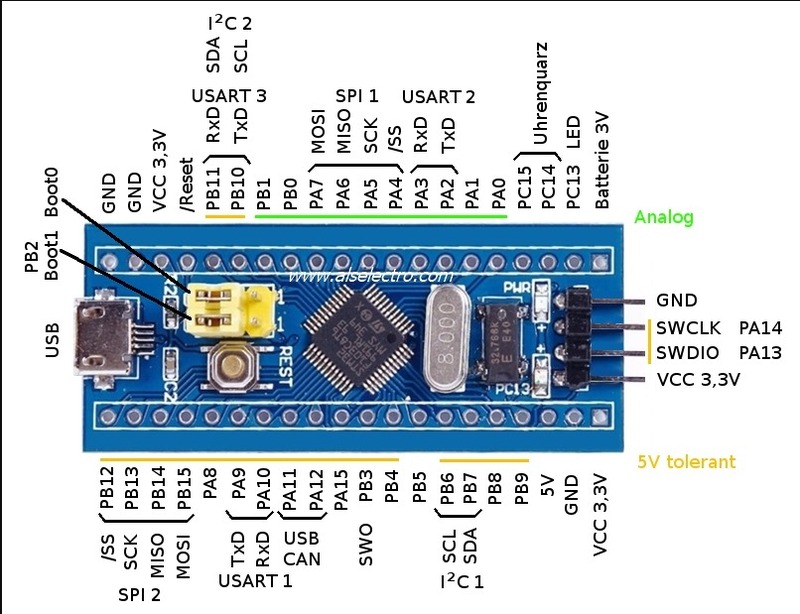 Even though there is a USB port on the board, you cannot use it to program it because it does not have the relevant bootloader. In the next post we shall see how to upload using USB. 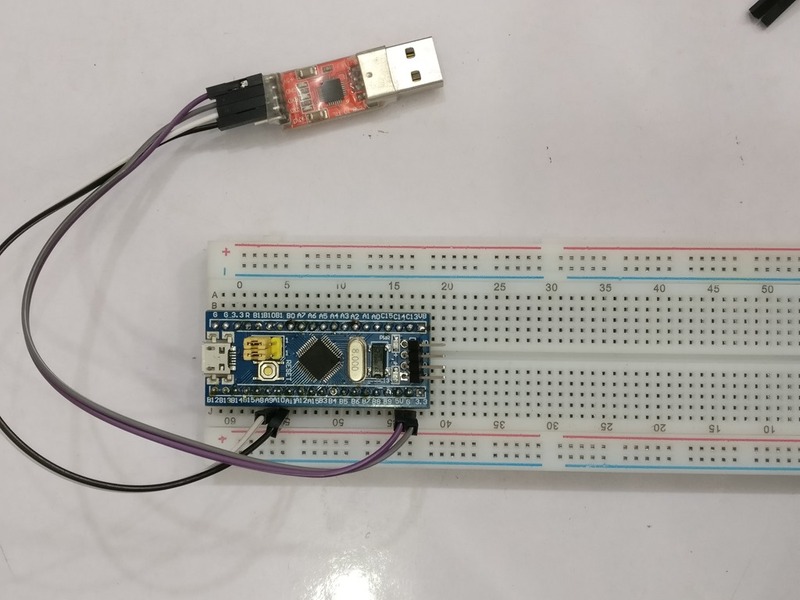 For now connect the USB-TTL module to STM32 . 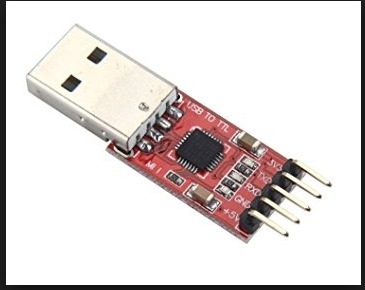 Plug in the USB-TTL module to USB of PC. 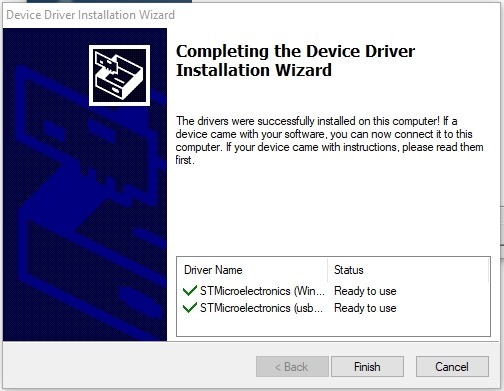 CP2102 device driver is required so that PC allots a port number to the module. You can see 2 yellow jumpers on board.The bottom one is BOOT 1 & the top one is BOOT 0. 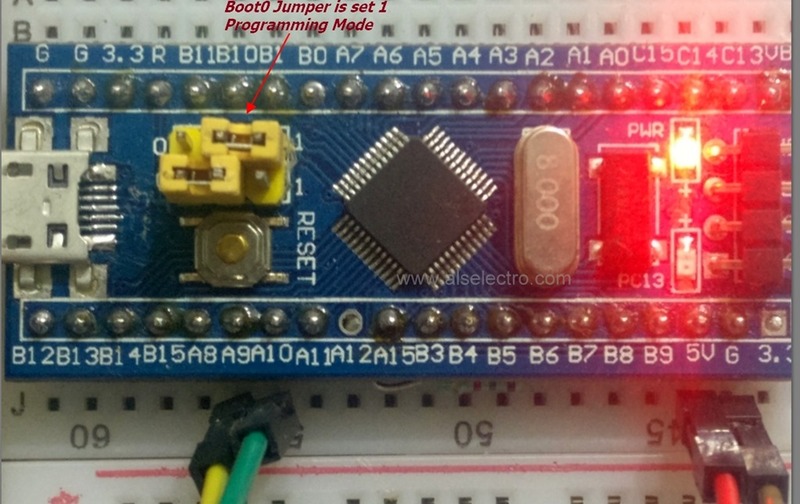 For programming you need to shift the BOOT 0 jumper to make High as shown in photo below. 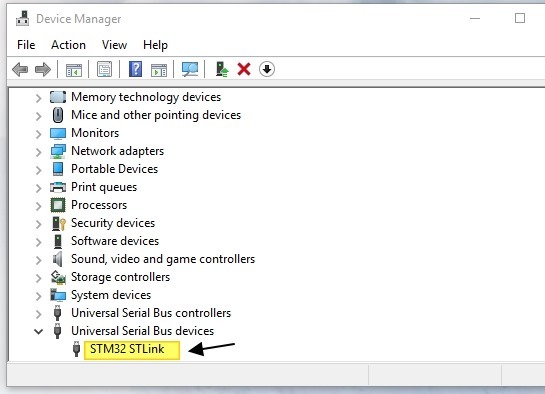 The setting of Jumpers specify the source of code for the STM32. 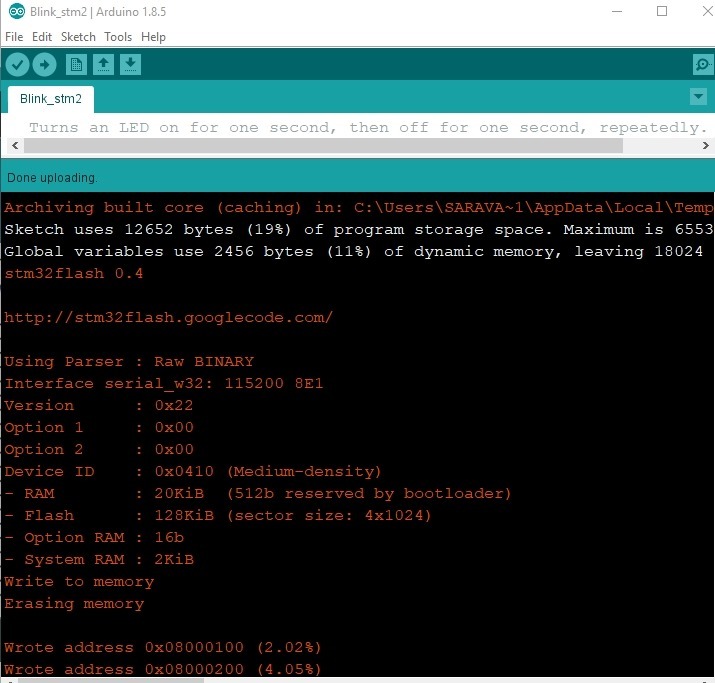 To program the micro using USART, you need to set BOOT0 as 1 and leave BOOT1 to 0. Move the first jumper and leave the second one. 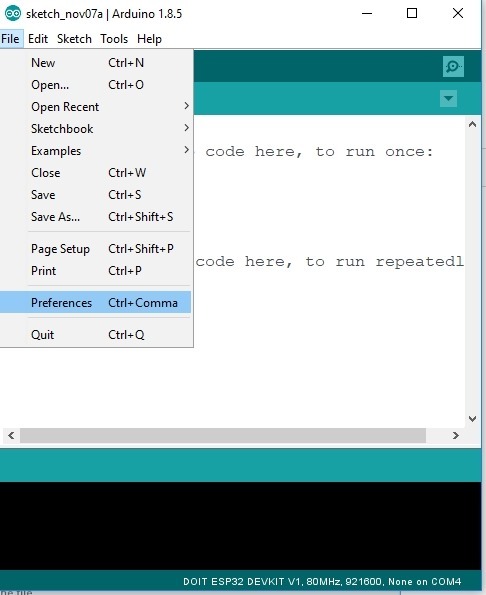 Open the Arduino IDE . Internet connection is required to install board support chain link. 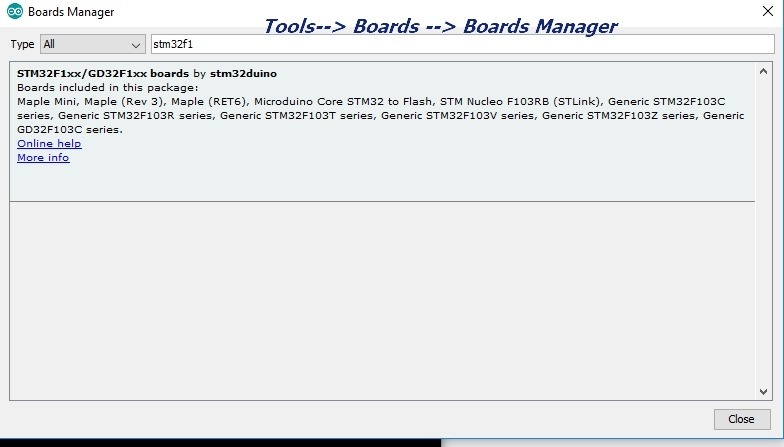 Type in STM32F1 & select STM32F1xx boards by stm32duino. Select the latest version & click install. It takes some time to get installed. Now reopen the ARDUINO IDE. 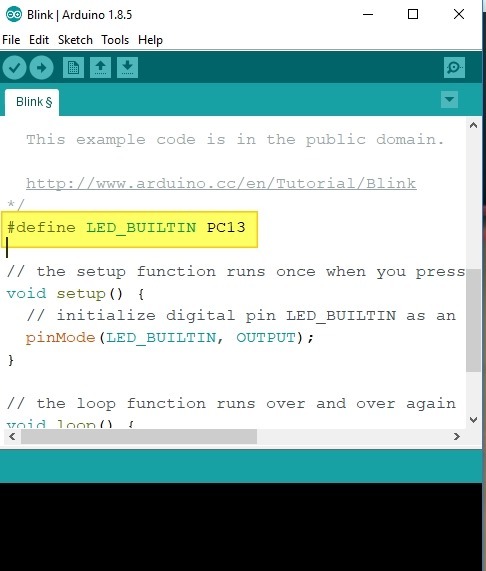 Once the code is uploaded you can see the built in LED blinking accordingly.Now you can reset the BOOT 0 jumper back to 0 position & press Reset to start the freshly uploaded code. For next upload you need to set the BOOT 0 to position 1 & press Reset button. 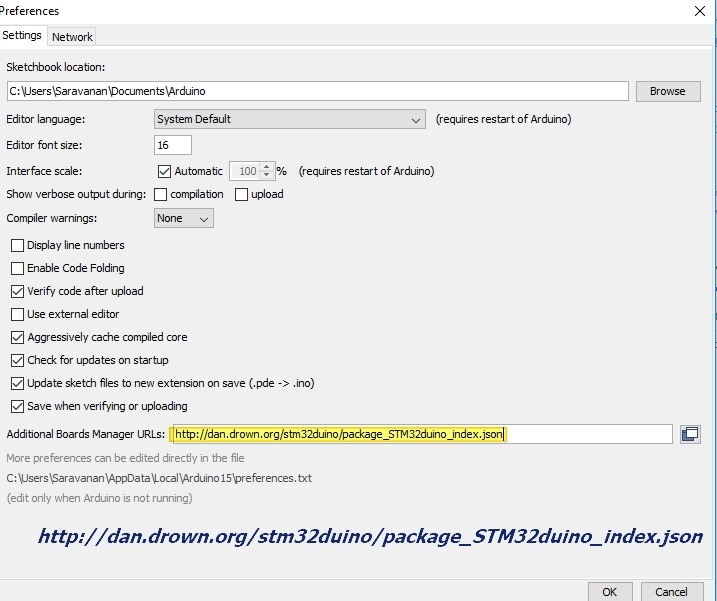 Let us see the second method to upload code through SWIM. 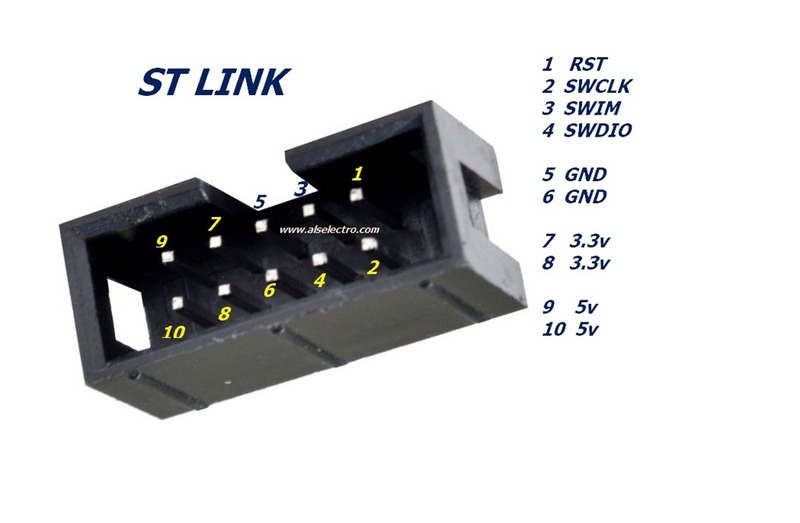 The pin details of STLINK is printed on the module itself. Note that there is no need to shift Jumper in this method of uploading. Just click on upload to see the inbuilt LED blinking. – It should read: Let us see the second method to upload code through SWD.!! !